Where do I use my Cowshed voucher code? Choose a discount code, copy it and follow the link through to the Cowshed website. Here you can choose your items and add them to your bag. Once you’re happy with your bag, checkout. On the ‘Shopping bag’ page you can enter your code into the ‘Enter a promo code’ box located underneath your items. Paste your code and click ‘Apply promo code’ to enjoy your savings. Cowshed offers a holistic way of caring for your body with the help of products and treatments that are all natural and cruelty-free. Their bath, body and skin care products promise effective results to both your mind and body as it showcases calming scents and reliable and effective results from all-organic ingredients. 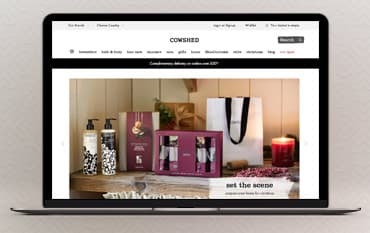 With their years of expertise, Cowshed has created a range of organic, natural and fairly traded therapeutics, bath products and skincare, as well as homeware, loungewear, maternity and snoods. If you love to shop, eat, drink, meet new friends and more importantly, indulge in sociable grooming or luxurious therapeutic treatments, then a Cowshed Spa is the perfect place for you! Offering a complete range of treatments from speedy quick-fixes to full body massages, body scrubs, facials, waxing and nail maintenance, you can rest assured that when you leave a Cowshed Spa, you will feel revived, rejuvenated and pampered. Cowshed has even launched their 'Bridal Package' to ensure you look and feel amazing in time for your big day! Browse the Cowshed packages today and why not use one of our offers or discount codes before you check out to ensure you're getting the best price possible! Happy Pampering. When it comes to Skincare, many of us forget just how important it is to take care of our skin, but at Cowshed, they make it easy to find everything you need for keeping your skin looking flawless, all in one place! Whether you're in search of facial oil to restore radiance, or a hardworking everyday moisturiser giving your skin a smooth finish and an added glow. All Skincare products at Cowshed are packed with pure essential oils and plant extracts, whilst the Clarisonic gives your cleansing regime a boost. You are sure to find exactly what you need to check out the collection today! Featuring products for your hands & feet, cleansers & toners, oils & serums and moisturises, you can narrow your search down to find exactly what it is you're looking for. Why not use our voucher codes for an added discount too! Whether it's for friends, family or companion, you can find the perfect gift for all your loved ones at Cowshed. From gift sets to grooming tools and accessories for both men & women, why not gift someone with a present they will certainly get their use out of, the results will speak for themselves! Start your search today and you are sure to find something which your recipient will love. Do Cowshed products contain allergens? All of the products in the spa inspired range undergo a skin safety assessment test before they go on the market to ensure that they are safe for human use. However, because of the high ratio of essential oils used in our products we recommend a skin test before use, especially if you have sensitive skin. Just place a drop behind the ear for 24 hours to check for a reaction. How to I contact you for product information? Can I make a spa booking online? Unfortunately, not all of our spas are able to accept online bookings. Please go to the "visit a spa" section on the website and select your chosen spa. If available, you will be able to click through to the bookings page. A cowshed might be an unlikely place to discover a range of award-winning bath, body and skincare products but that's exactly where this company was born. Since the opening of their first spa in the old cowshed at Babington House in 1998, Cowshed's ambition has been to create spas and products that are always honest, natural and true to their British heritage. Made in England, Cowshed's award-winning products use the very best organic and wildcrafted plant extracts and mood-boosting essential oils to nourish the mind, body and soul, whether you’re experiencing them in one of their own spas or the comfort of your own bathroom. Use a Cowshed voucher code and save when you're at the checkout.